DURHAM, NC - The Murphy Bulldogs reeled off 21 first quarter points on their way to a 60-27 victory over Pamlico County and the school’s ninth NCHSAA football state championship. The win was Head Coach David Gentry’s 406th career win, which is second all-time for Head Coaching wins in the NCHSAA. 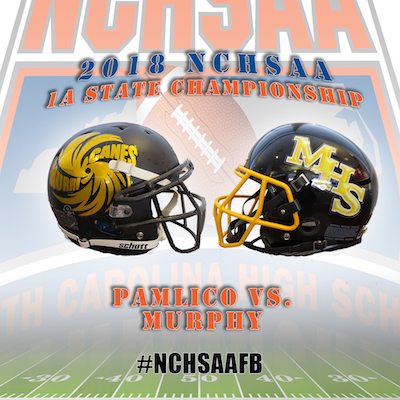 Pamlico did not quit despite trailing 35-7, after a long kickoff return into Murphy territory by Jarrod Ramsey, Murray bought time and found George Jones open over the middle for a 42 yard touchdown pass to make it 35-14 with under a minute to go in the third. Just three plays later, Murray raced 46 yards to the end zone for a touchdown, however the point after failed and Murphy led 41-14. Player for the Hurricanes for his efforts. William Lovick was the Hurricanes’ Most Outstanding Defensive Player as he tied for the team lead in tackles with nine. Hunter Shope took home Most Outstanding Defensive Player honors for Murphy, racking up nine tackles, 1.5 of them for a loss.